We teach classes all over the Northern Beaches, from Seaforth up to Palm Beach. Tanya’s Tadpoles offer home swimming lessons on the Northern Beaches in your own pool. Our programs include swimming lessons for babies as young as 5 months old. We teach learn-to-swim and stroke development classes for pre-schoolers and school aged children, right up to junior squad level. We teach all 4 strokes and our focus is on developing the correct techniques, so kids have the swimming skills required for recreation or for swimming competition. 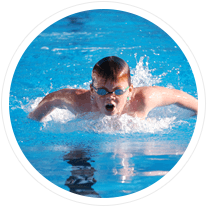 We teach swimming in the comfort of your home swimming pool to ensure a more relaxed learning environment and we aim to make classes fun for all involved. 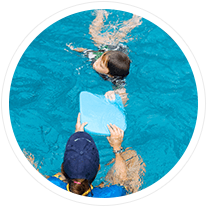 All our swimming lessons on the Northern Beaches are conducted by our AustSwim or Swim Australia qualified instructors who hold current resuscitation certificates. Our friendly instructors are also personally trained by Tanya to provide care and quality teaching for our swimmers. The Northern Beaches has some of the most stunning beaches and secluded bays along the Pacific coastline. In a place known for its gorgeous swim spots, knowing how to swim well is an essential skill.